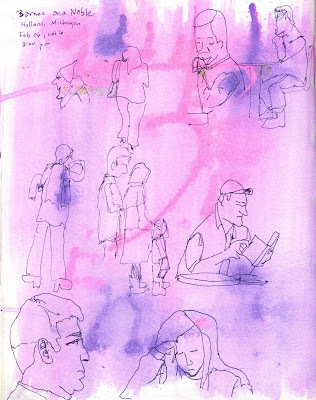 That's what we've been up to recently in my class with Roz Stendahl, Drawing Practice: Drawing Live Subjects in Public. Thank heavens we don't always have to draw live subjects or in public. We get to practice on the stationary, and at home. 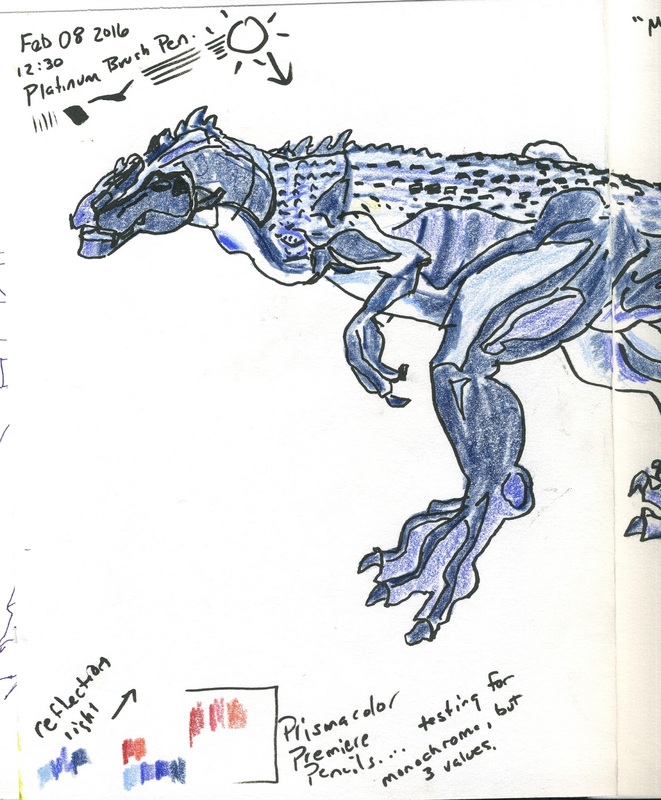 I mentioned in an earlier post how I practiced values on my plastic allosaurus. I did these drawings practicing on my toy Holstein. Values to show volume. In this first scribble, with fineliner and gouache, you can see me struggling to even see what the heck I am trying to draw. No kidding. My brain wouldn't even see values very week, much less enable my hand to render them. Whew! This was very hard work for me. Seriously, like match. Made my brain tired. But you can see me just starting to see shadows and shapes of shadows. Just trying to figure out how to quickly get them down. I tried first in pen (the black hatch lines). Then I tried again with the paint. Just experimenting. Feeling my way. No pressure. 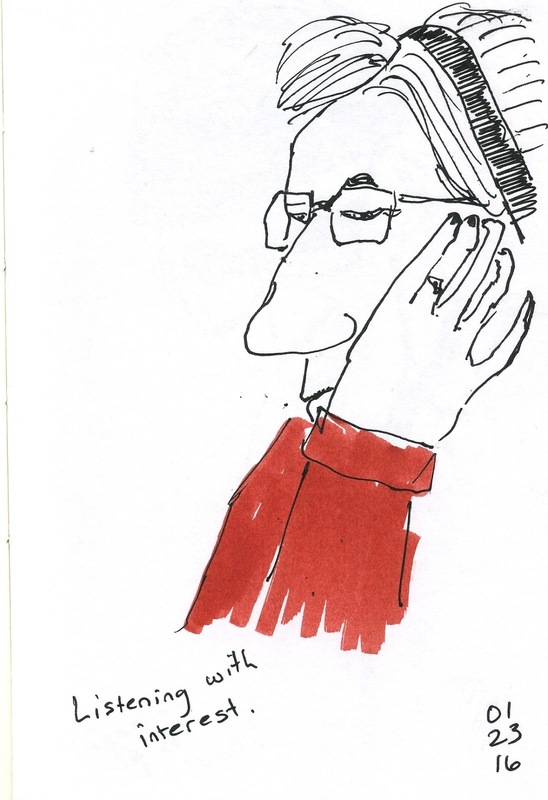 That's the point of scribbling, of practice. Figure it out. Then I did it again. 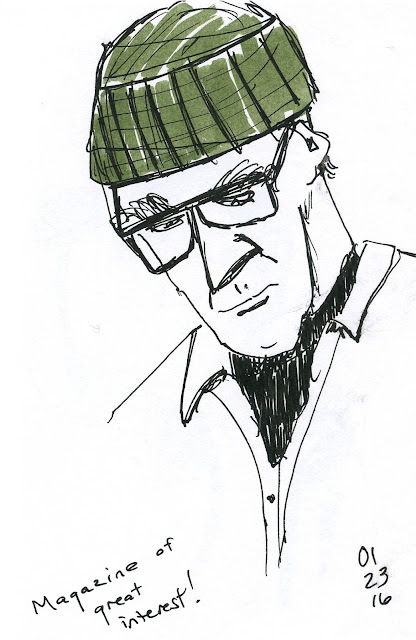 This time I limited myself to black and white and used a fatter, less fussy brush pen. 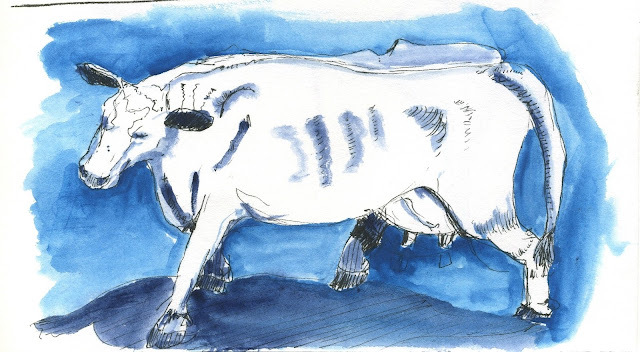 I also changed the cow's angle, just to give myself something new to look at. Much better results this time! After only ONE practice drawing before this, allowing myself to feel my way with that fineliner and paint brush, I understood more about what I could see, and how to get it on the page. This is why if at first you don't succeed, one should try, try again. 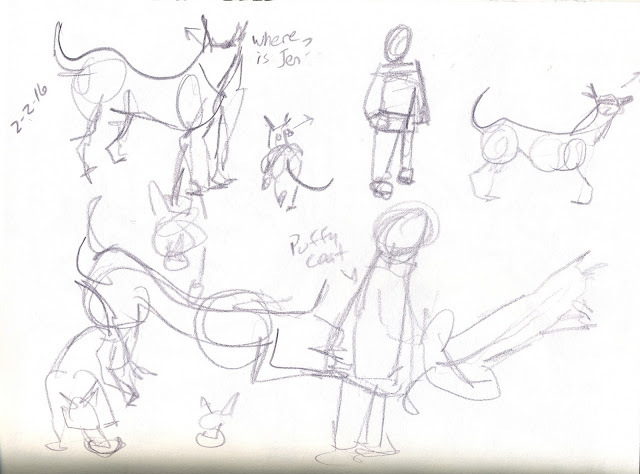 Scribbling practice is creative practice. We don't do that enough, in this culture of instant gratification: try, try again, I mean. I see it in my students. So many of them write the very first sonnet of their entire lives, can't master iambic pentameter, and ditch poetry as something "I can't do." That makes me sad. It's just scribbles, I tell them. 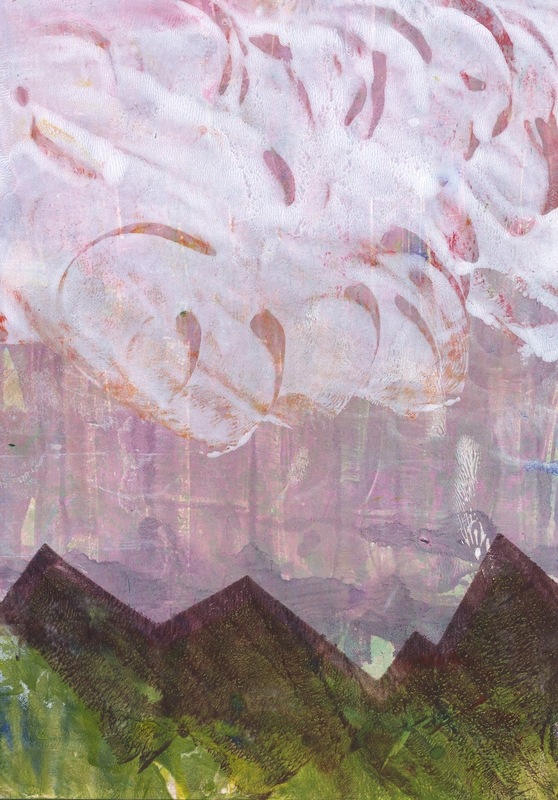 It doesn't even cost as much money as art supplies to scribble creative writing. Try again! It's a lost art, scribbling. That's what the cow says! 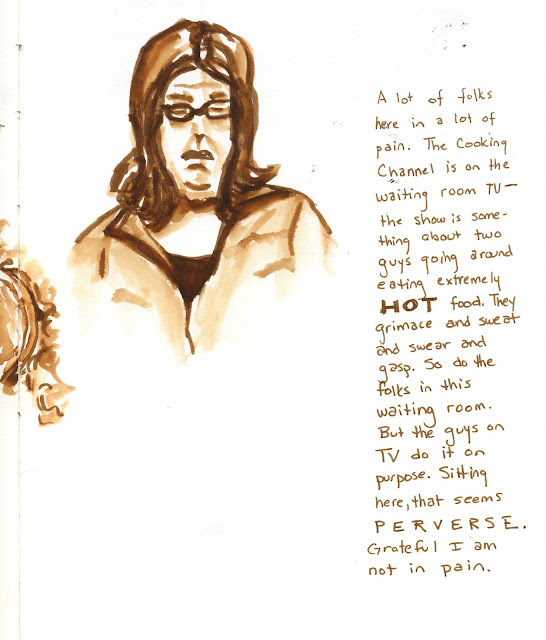 As part of my practice for Roz Stendahl's Drawing Practice: Drawing Live Subjects in Public class (highly recommended! 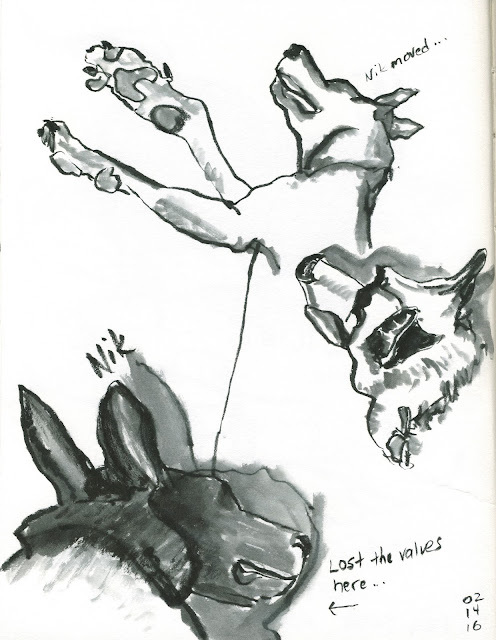 ), I have been working on capturing aspects of my two Dutch Shepherd dogs, Nik and Nora. Note: you don't have to draw everything live, or in public, for this class. But there are commitments. These drawings were done with live subjects, but at home. It's interesting to collect a few here from across the first two weeks of class. First gesture drawing. Fast capturing of basic shapes and movement and relationships. In early February, I completed these with a Tachikawa G Nib fountain pen, one of my favorite fine line pens, in my Hobonichi planner--one of my favorite little books to carry around and scribble in. (You can get the pen and planner at Jen Pens.) In these sketches, the dogs are sleeping, so not very mobile. You can see me working on the basic shapes, the spine lines, the relationships of the parts ot each other. About two weeks later, on Valentine's Day, I did another page of gestures of the two dogs in fast motion as they wrestled with each other. I completed these drawings with a brush pen (not sure which one, but probably a Pentel Color Brush pen) on Strathmore 500 mixed media paper. 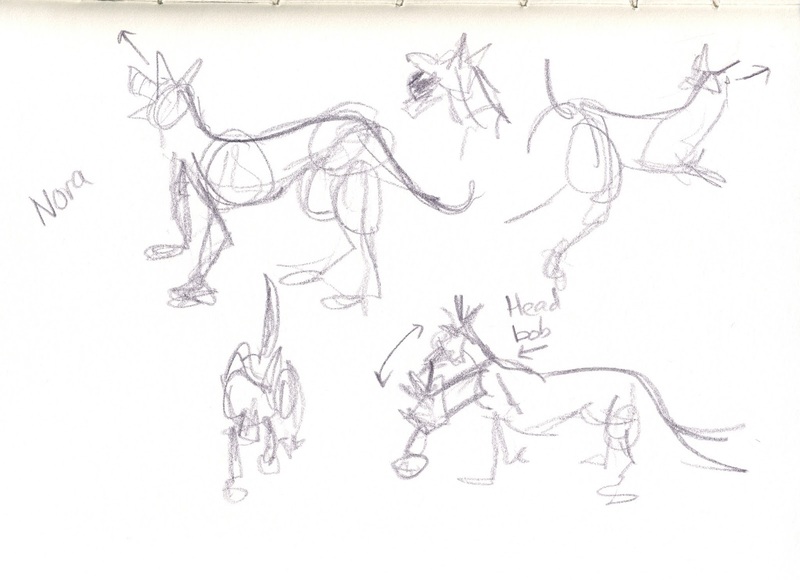 Here you can see my much stronger focus on the spine line as the focus or "grounding" of their entire forms. 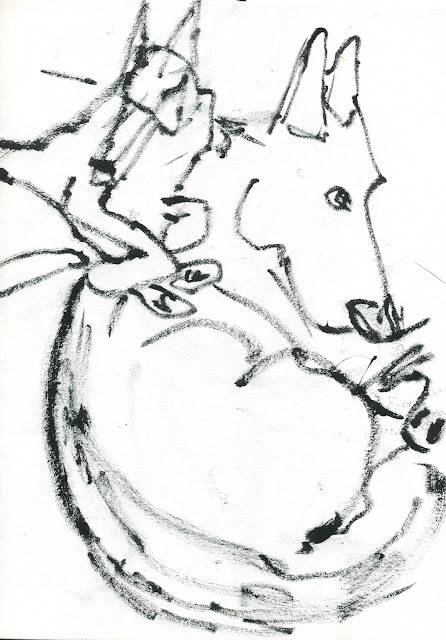 I'm much looser, less concerned with accurate contour, or outline, and more interesting in the twisting and energy of each dog as they combined into one form. It might look like a bigger mess, but for me, this is enormous progress. So many artists, myself included, want to draw "looser," which for me means less fussy. Or, I guess to put it in a better way, when people (including myself) look at it, I want the drawing to be less accurate (I can use photographs for accuracy) and more a container for the experience as I felt it, conveying it to the viewer in some way so that he or she can feel it too. This is exactly how I approach my creative writing--and how I focus my students on it. Creative writing is about creating an experience for your reader, and surprising yourself with your observations as you write. 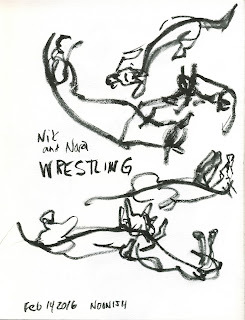 Anyhow, after capturing gestures of the wrestlers, I was able to practice a bit of capturing volume because Nikolaas took a nap in the sun. Light and shade were harsh as I studied him, and in the bottom sketch, I lost his dark chocolate coloring in the shadow. 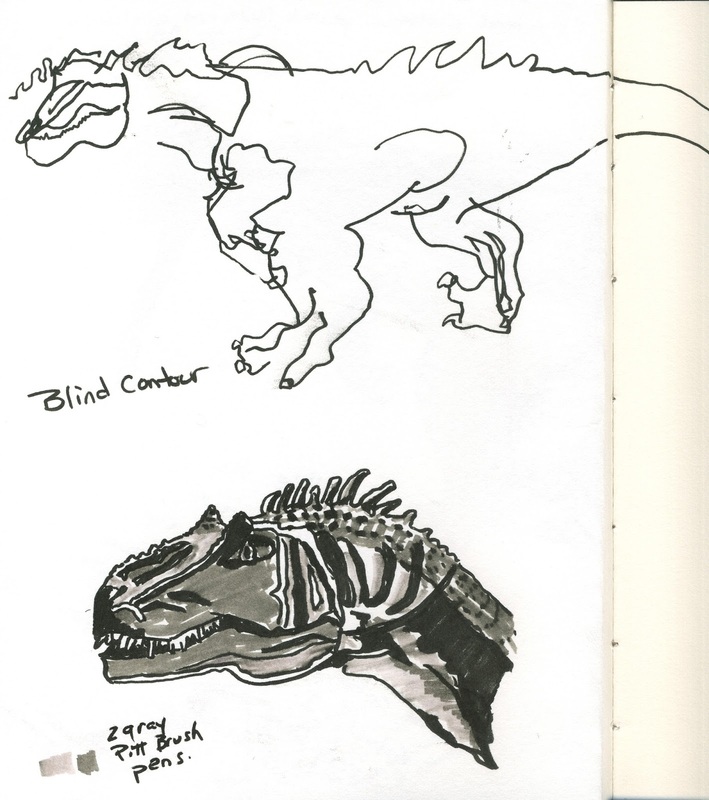 But I captured the basics pretty well in the top two drawings. And I am quite entranced with the lines around his feet at the top. 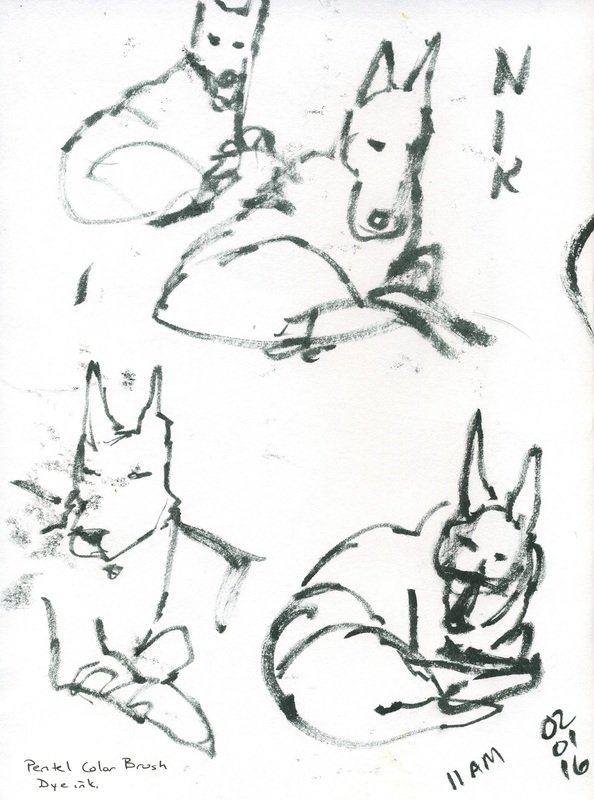 These sketches feel to me like the closest I've come to capturing a sense of the dogs and how they are in their lives. I look forward to much much more practice! What a wonderful thing it is to look forward to practicing something! I never looked forward to practicing piano as a kid. This is so very different. I have a friend whose passion is her yoga practice. And she means that, the "practice" part. I think maybe most of us don't have enough practice in our lives. It's the practice that allows for experimentation, discovery, fun and meaning. Practice. That's what scribbling is. Last week in the "Drawing Practice" class I'm taking with Roz Stendahl, we practiced learning to see values. We also practiced how to capture them quickly because, ultimately, we want to be able to use them to depict live subjects in public places. For practice, Roz recommends using high quality toys. I pulled out my allosaurus. I haven't drawn her in a while. I have a very hard time seeing value. This I know from other failed attempts. 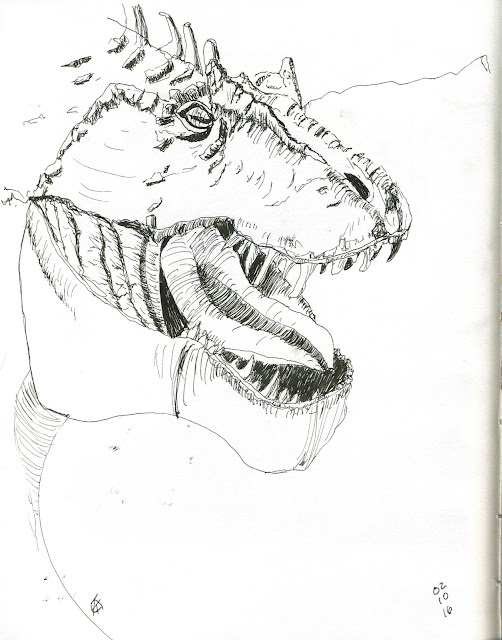 So the first order of business, for me, was to use my newly honed awareness of contour drawing and draw contours--outlines--of the different shadow shapes I saw on the dino. Then I filled in those shapes with different shades of blue (after I thought about red, but decided against it). You can see the results below. You can see all my notes, a little bit of my frustration in trying to capture the values with colored pencil. I think I made it too hard for myself. I forgot the principle of scribbling. Relax, have fun, make marks, enjoy the process. See what you can learn and what you can enjoy. So I turned the page and reset myself by doing a blind contour of Allie. 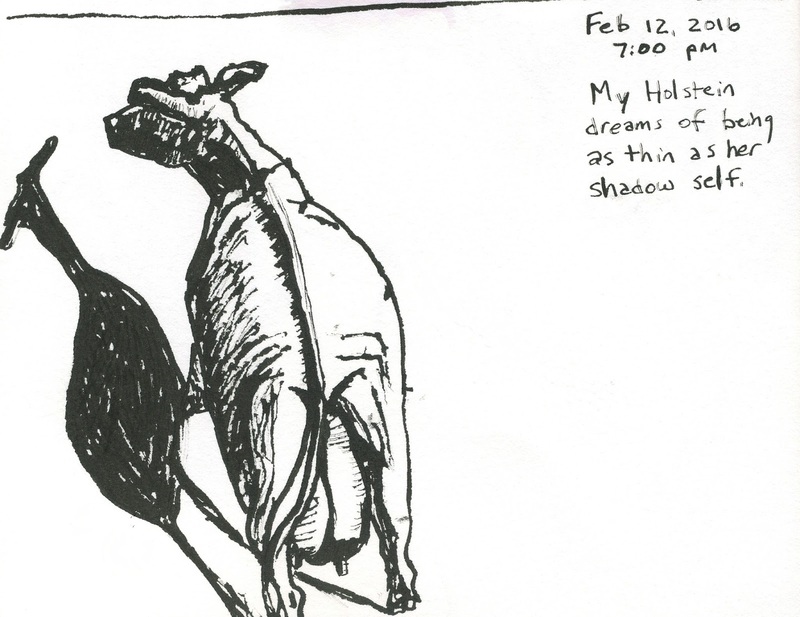 Then I tried the shadow shape contour drawing again, using the paper's white and three pens in black and two grays. I had a much better time doing these scribbles. 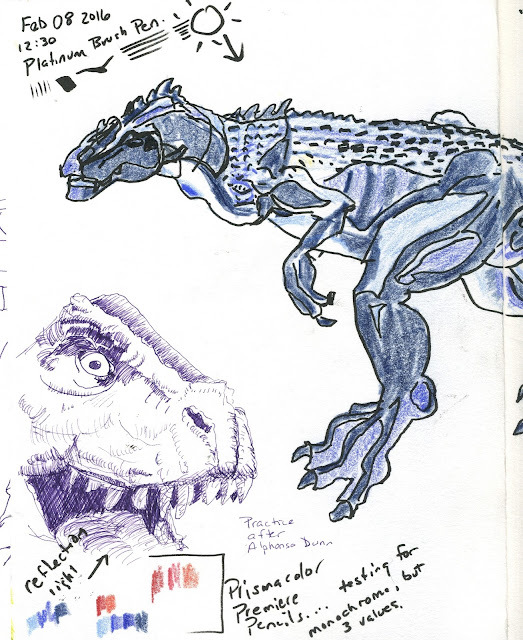 You can see, in fact, I actually was scribbling with the markers, coloring in and really just enjoying myself. I felt quite good about the giant step in rendering volume I took, just because I backed myself up, loosened up, and set myself a more manageable task. I wanted to back up a bit more, though. Try to see what I could do to understand and capture values with just a pen. So I went looking for inspiration and education in one of my newest books, Pen and Ink Drawing: A Simple Guide by Alphonso Dunn. And voila! Not only did I get to see some pen-specific value techniques at work, but he had a drawing that looked exactly like my allosaurus. I immediately found an empty spot on a page and did my best to copy it. See below in purple ink. I have written about the importance of studying and copying mentor artists before. I teach this technique in my creative writing classes and I find it always useful in drawing. Just making this one copy taught me a lot. Look what happened when I next tried to scribble some value with Allie. Next, I changed position so I could be sure I wasn't just reproducing from my visual memory of Dunn's drawing. And I changed tools as well. What I'd like to improve about both of these is proportion--I shorted up her jaw quite a bit. I kind of forgot to measure because I was so excited about finally having my brain click on the value thing! Later, I tried one more time and in a different way: this is a scribble drawing of Allie in my Hobonichi planner. I really really like the energy of this one! 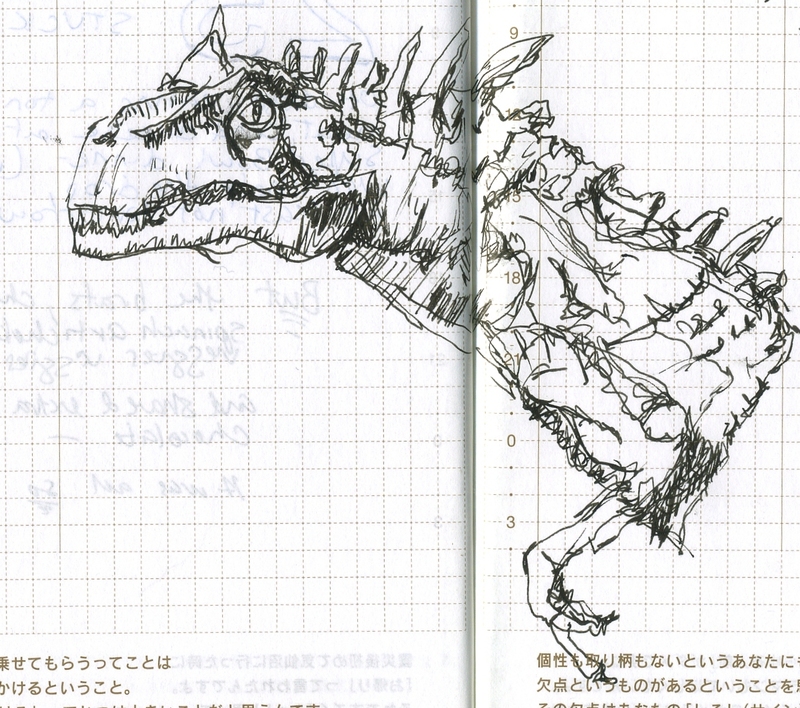 This is the sort of drawing I want to make. A few days later we switched to water media. You'll see in my next post what happened when I took that out into the field and worked on live (but slow moving) people. But when I first started, I tried a different animal. 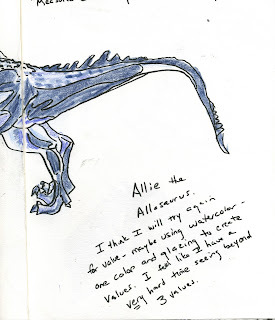 And though a cow is not an allosaurus, my work with Allie sure helped me get this first quick brush scribble down. What I like best about this is, hey, you can tell it's a cow! 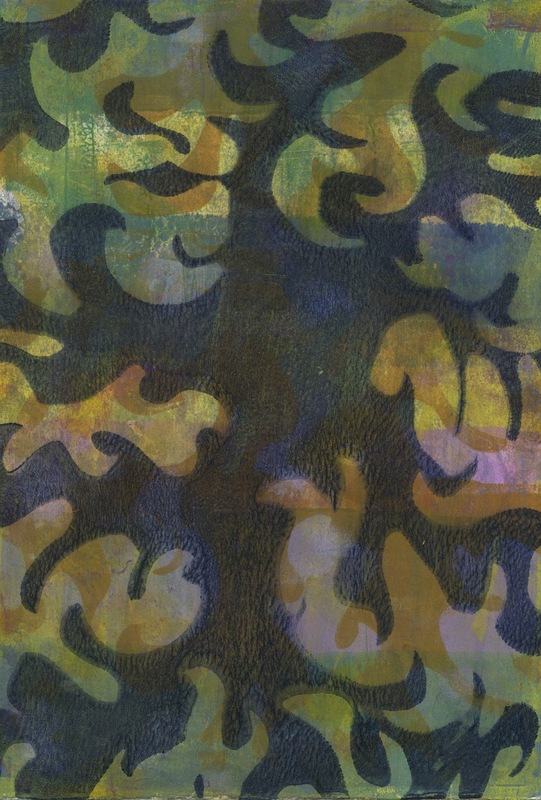 Plus, the blue gouache is lovely. 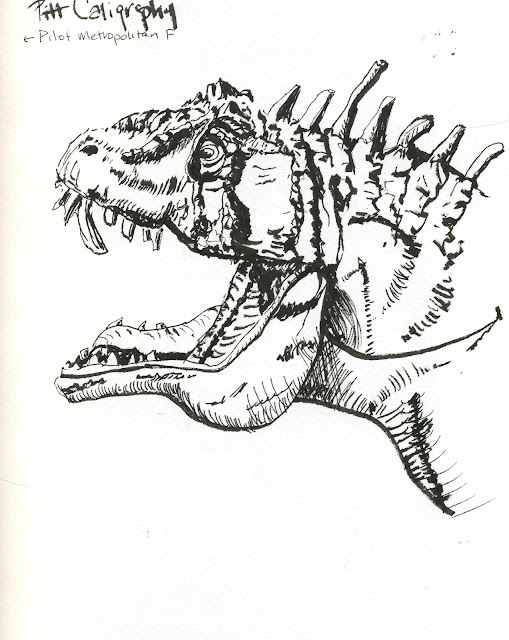 I had hours of fun this week drawing my plastic dinosaur. Others are doing flowers and fruit and lovely arrangements of still life objects. Gotta draw what you love. You are what you give your attention to. After three days of intensive focus on fast gesture drawing, Rox had us switch to slow contour drawing. I thought, no problem. I've been practicing contour drawing for over two years now. Yeah, well, not with the impact of gesture drawing behind it. I loved the sense of volume and energy I got from my gestures! I didn't want to give it up for contours, which suddenly feel stiff and a little cold to me. 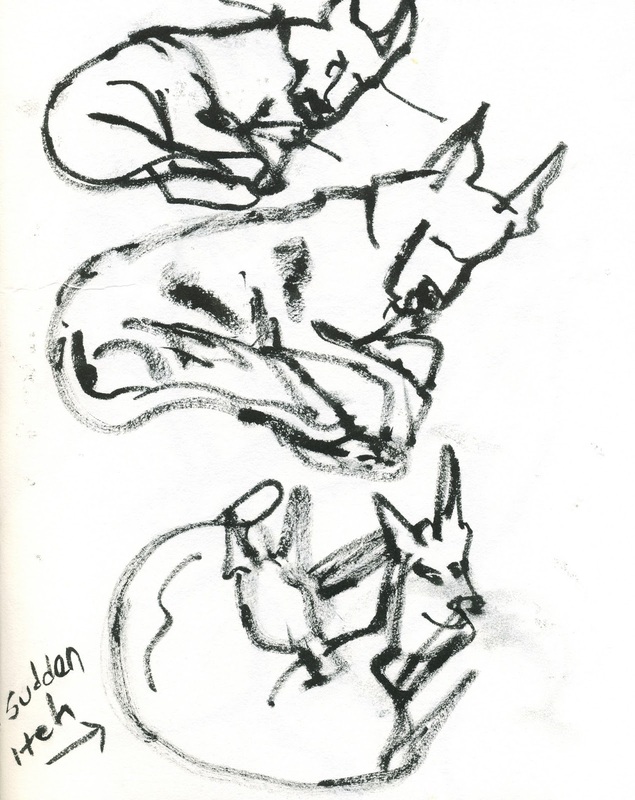 How to think about gesture--energy, shape, volume--and still follow contour? One of my classmates made the terrific observation that this is all a bit like learning a foreign language, and having to consciously translate into new syntax all the time. Yeah, it is like that. 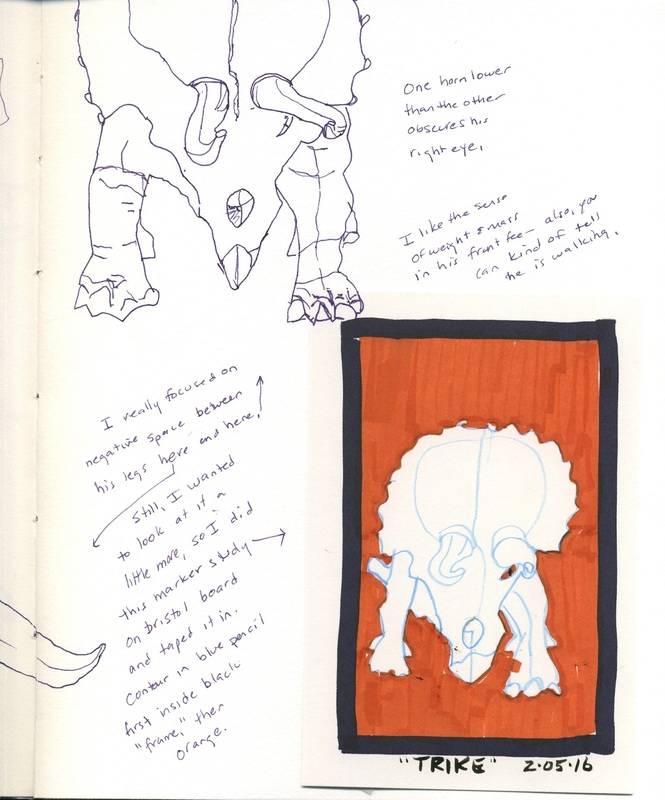 Roz encourages us to use detailed, made to scale, plastic toy animals, or taxidermied animals, to practice learning animal anatomy on something that doesn't move. 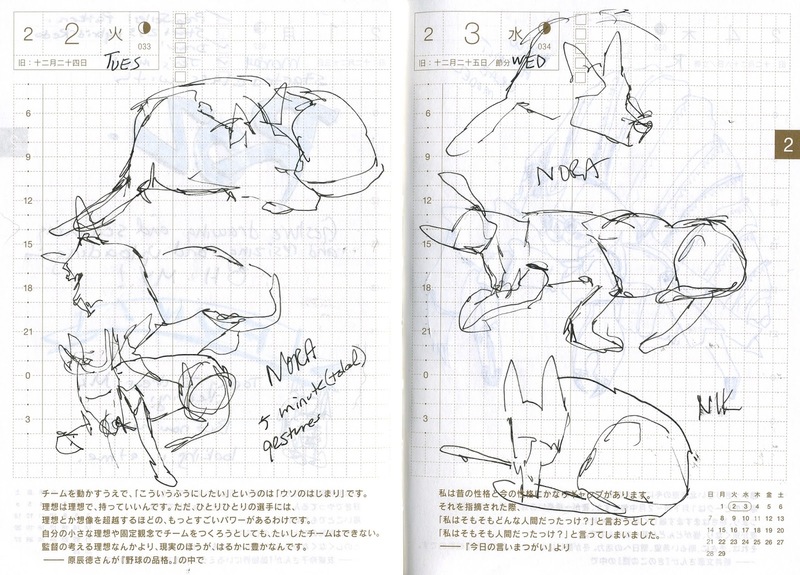 Then we should be better suited to draw live animals when the time comes. Following her example, I "adopted" several such toys. 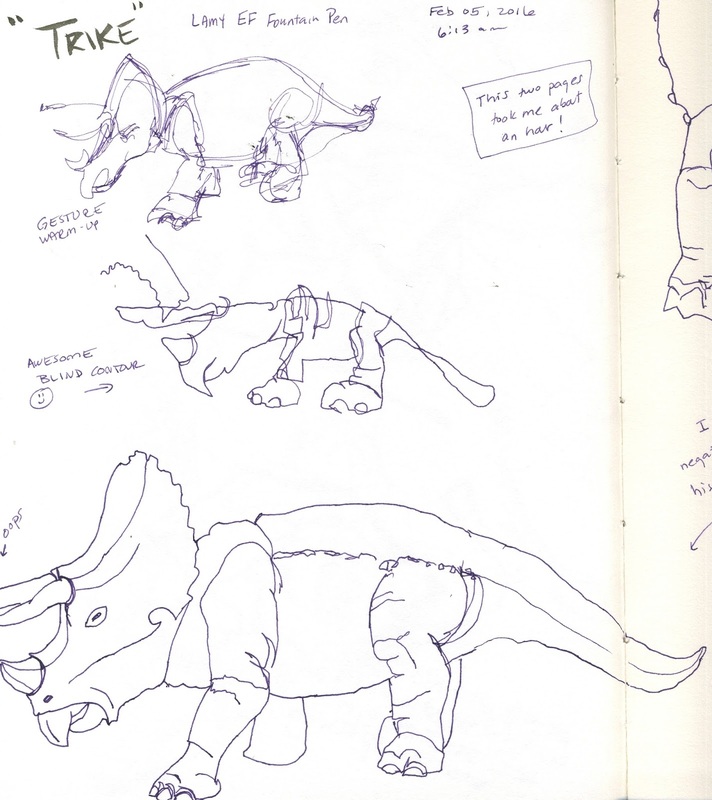 Below you'll see my work with Trike, my triceratops. 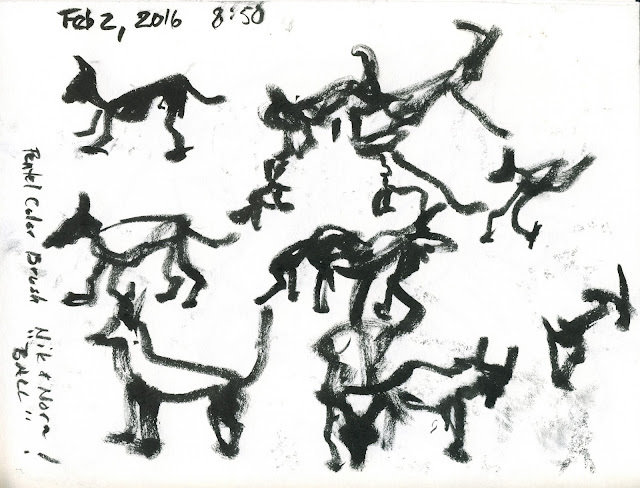 First, a gesture, then a blind contour, then some modified contours in different positions. Finally, a study of negative space. I used my Lamy fountain pen with an EF nib for these. 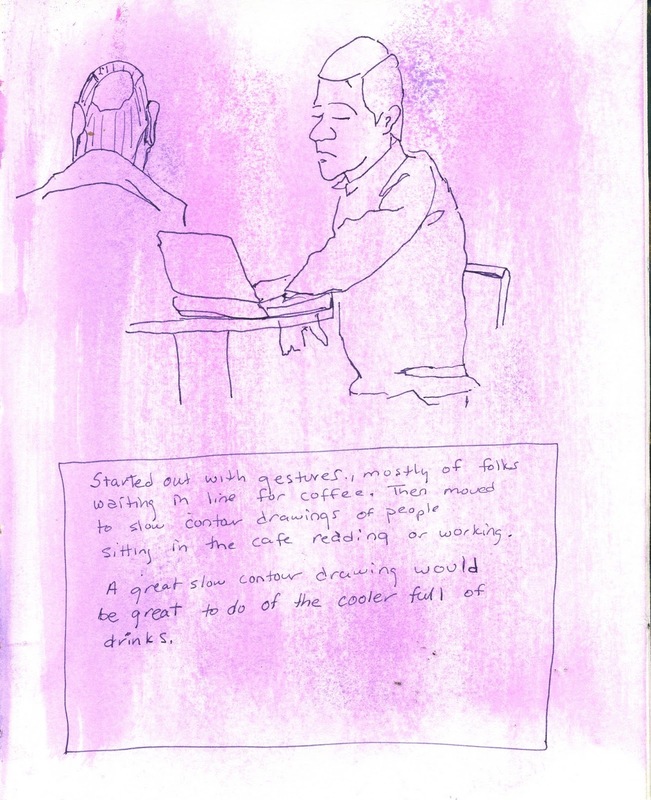 We are supposed to draw live subjects out in public as frequently as possible too. 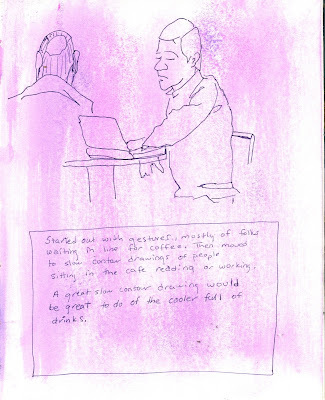 And for contour drawing, which is slow and concentrated, coffee shops and waiting rooms are the best. 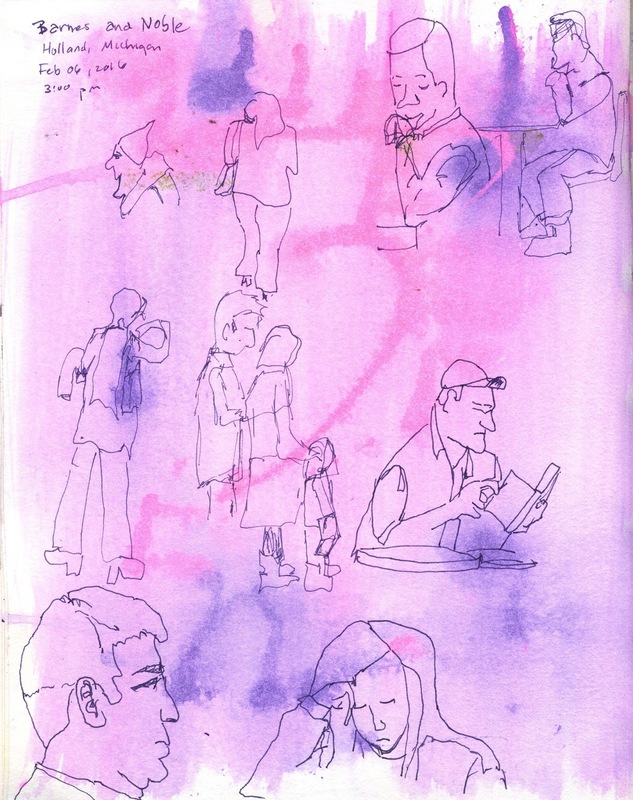 People are generally preoccupied and fairly stationary. 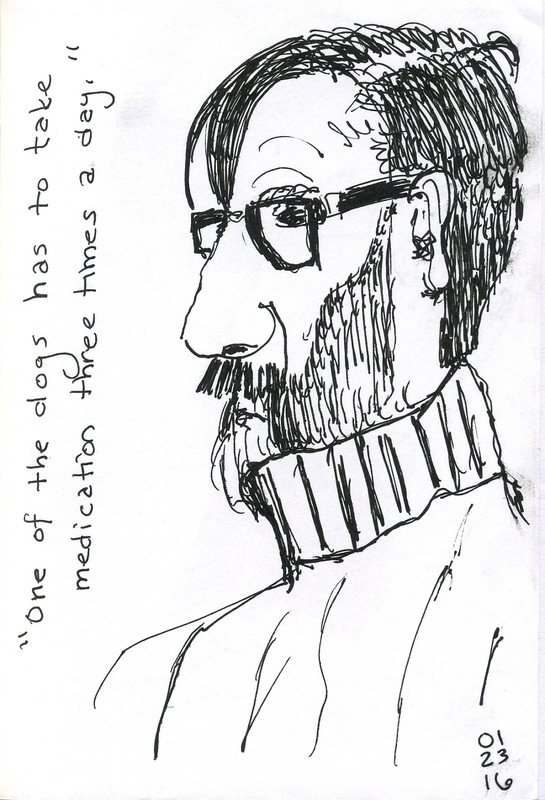 When you adopt scribbling as a habit, you never get bored in a waiting room! Plus, when I do pages like the ones above, I find myself wondering about the people as I draw them. Who are they? What are they thinking about? What passions and struggles to they carry as they sit here, waiting to see a doctor or waiting for an oil change or waiting to get their new driver's license photo taken? I like how creating these sketches brings me more awareness of the strangers whose paths cross my own. 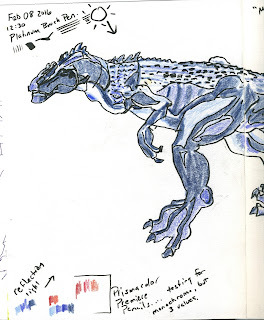 Also, perhaps obviously, I had pre-painted those pages, just to add a little random color for my sketching. I don't always like practicing on just white. 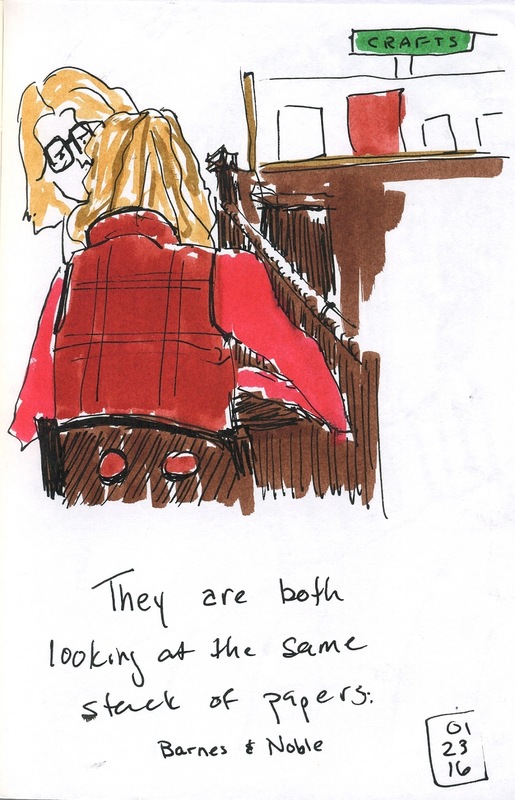 As another shot at practicing contours on live subjects in public, I attended a local musical showcase. Here a different artist or group sang every song. So I got a relatively stationary subject for a few minutes, and then a new subject. 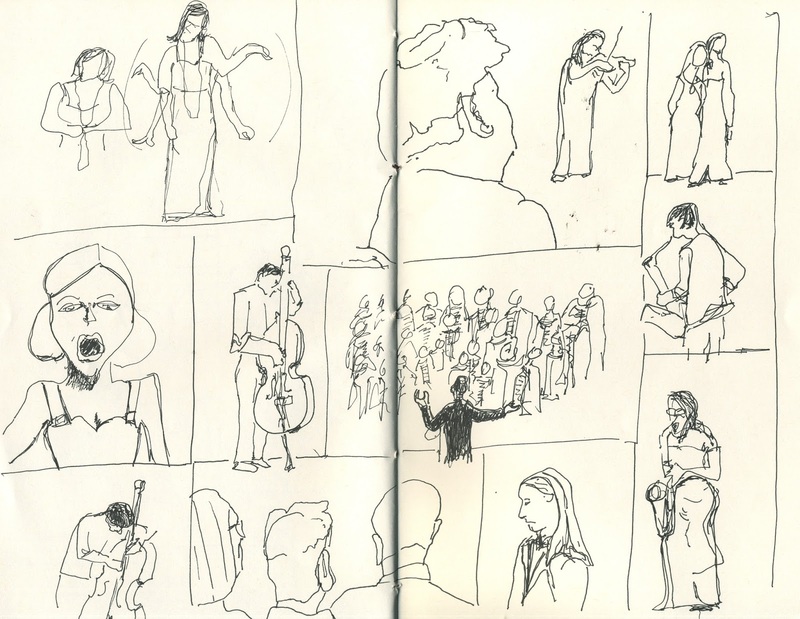 It was a challenge to move slowly, stick only to outlines, and capture a bit of each performer. Just one of the pages I produced during the two-hour concert appears below. Here I am using a .03 fineliner waterproof ink pen. I combined contour with gesture in some places. 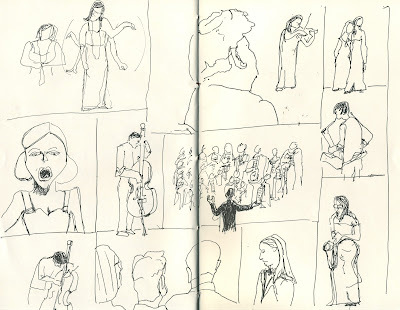 For instance, I used gesture to capture the choir in the middle, but contour for everything else on the above page. I liked understanding the different qualities of each and being able to choose which to use in which situation. The "aha" of finally getting what gesture is and why it matters finally clicked as I chose it, or chose not to use it. I think I heard the music better because I was drawing. I certainly felt completely lost in each performance. I have begun a wonderful intensive course called "Drawing Practice: Drawing Live Subjects in Public" with Roz Stendahl. 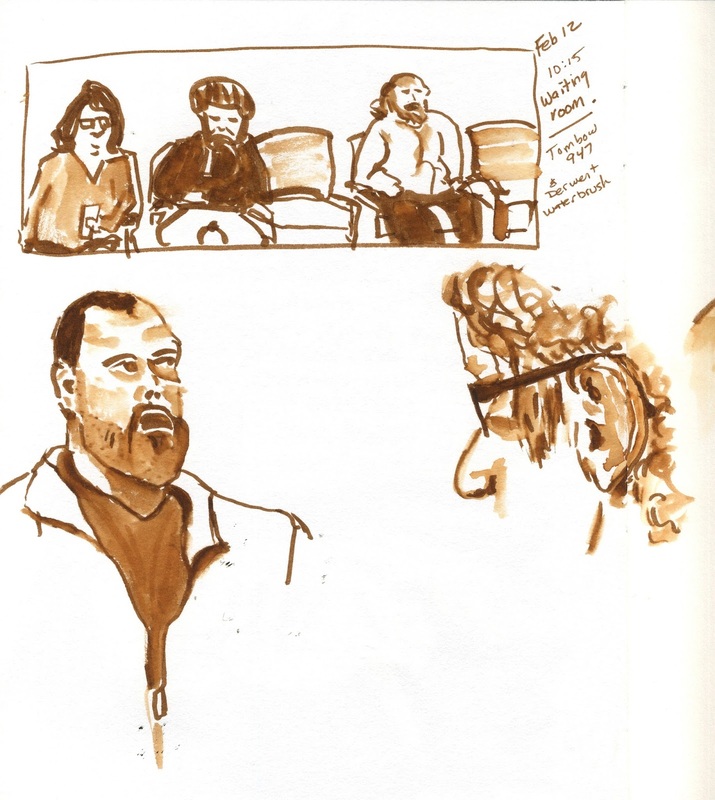 As Roz says, "In this class I will introduce you to drawing exercises and approaches that develop the skills necessary to work quickly and accurately while sketching live subjects in public." We have daily homework. Weekly sketchouts. Special supplies. 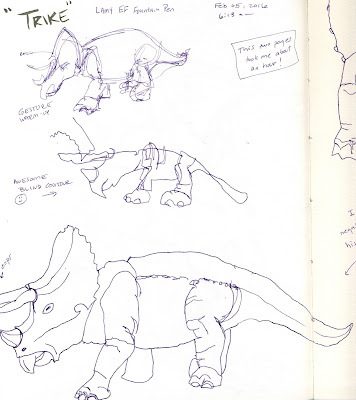 I first "met" Roz and her terrific approach to drawing, learning, teaching and life through the "Beginnings" course on Sketchbook Skool, which you can still take if you're interested. I recommend it! Anyhow, I look forward to sharing the work of this class here. I will do it on a bit of a delay, so I can think about things before I share them. I already know that it will be so much more than "just" drawing. Before the course even started Roz asked to think about goals and the blocks to our goals, especially the sneaky stealth Ninja moves our our internal critics. What does it mean to want to see more clearly, and create art that captures what you see and shares it with others? What does it mean to be "good" at doing that? Does it matter if you aren't good at the sharing with others part? Why? So what? These are the questions I had begun thinking seriously about before the class even started on February 1. Interesting questions which I deal with all the time as a creative writer and teacher of creative writing. But I've never really thought of it much in terms of my drawing practice before. What's the shift--in drawing--between wanting to capture things for myself and wanting to create an experience for my "readers"? Anyhow, to get myself rolling before the class started, I headed to the local Barnes and Nbole Starbucks and drew some folks. Fountain pen on tomoe river paper, color added with Koi watercolor pens. Each of these took less than five minutes apiece. 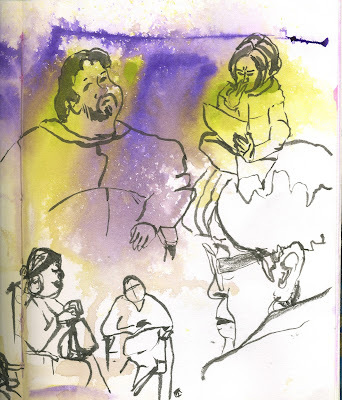 My goal was to try to capture a bit about the personality of each person, how they interacted with the reading material they had in front of them as well as with the persons accompanying them. When and how can I capture moments without so much input? Do I spend those moments alone or with someone? How you spend your moments is how you spend your life, right? I read something like that recently. Bumper sticker wisdom, in a way, but it does make some sense. Well, for the next month, I'll be spending a lot of moments intensely engaged in and reflecting on my own drawing practice. I look forward to sharing what I learn.